Location: Auzers, in the Cantal departement of France (Auvergne Region). Ownership / Access: Currently owned by the Douhet Auzers. Private home. 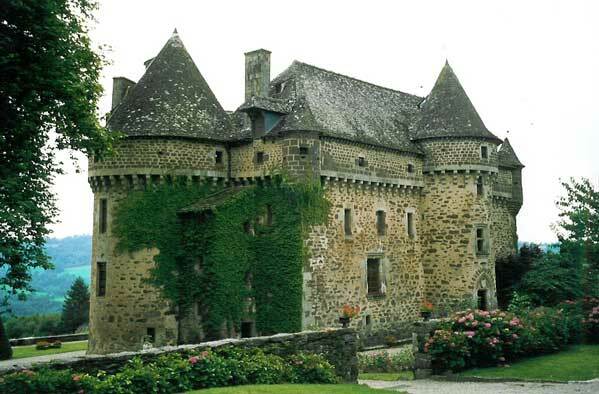 Notes: The Castle of Auzers is a medieval castle located in the Cantal Auzers. It is the subject of a classification as historical monuments since March 21, 1983 (façades, roofs, murals of the chapel) and an inscription from June 14, 2002.Built in the nineteenth century, the castle was built in the early sixteenth century. But its architectural design remains of medieval spirit: it has a rectangular main building flanked by two large corner towers and a stair tower; the whole is crowned by a machicolation Gallery. There is a walkway and watch towers. The interior decorations from different eras are conserved: a monumental fireplace, woodwork, fireplaces and floors of the eighteenth and nineteenth centuries. The oratory has remarkable wall paintings of the sixteenth century.